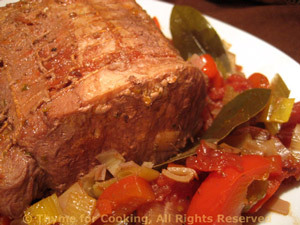 Loin of Pork, Braised in Red Wine with Red Peppers, Thyme for Cooking. I use a medium-size roast, about 2 lbs and it cooked to the correct temperature in under 90 minutes. As with most braises, longer cooking time is fine. Half of the pork and half of the vegetables and sauce are for another meal. Clean and trim leeks, discarding the dark green tops. Cut in half the long way and slice. Cut pepper into thick strips. Heat oil in heavy pot or Dutch oven. Add leeks, peppers, celery, garlic, and sauté until tender, about 10 minutes. Mix paprika, oregano and olive oil. Rub all over pork. Add pork to pot and brown on all sides. Add 1/4 cup of red wine and stir up all the browned bits from the bottom of the pan. Return vegetables to pot, arranging around pork. Add tomatoes, red wine and bay leaves. Dissolve cornstarch in water. Remove pork to a platter. With a slotted spoon, remove the larger vegetables and arrange around pork. Tent loosely with foil and let rest. Increase heat under remaining sauce. Add cornstarch, stirring until thick and clear - you may not need it all to get a thickened sauce. 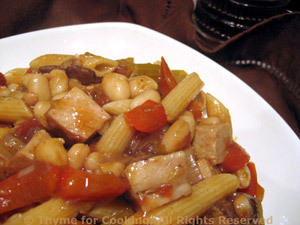 Slice some of the pork, spoon some of the sauce on the vegetables and pork and serve. Cut the pork into bit-size pieces. Gently reheat sauce with vegetables. When pasta is done, combine with pork and sauce. Serve.